The negative affects of a high sugar diet are well documented and so most of us will be only too aware that sugar free cooking is much better for our health. There are all sorts of health risks associated with the consumption of too much sugar, from the risk of morbid obesity and diabetes through to tooth decay and hyperactivity in children. Some sugar substitutes may have their own potential health problems or risks associated with them, so if you suffer from a particular condition or illness it is always best to check with you health practitioner when it comes to the specifics of your diet. Some artificial sweeteners can upset your stomach if consumed to excess, for example, and the natural sugars in fruit and honey can also be bad for your teeth. Those with diabetes also need to take care when consuming high levels of natural sugar. 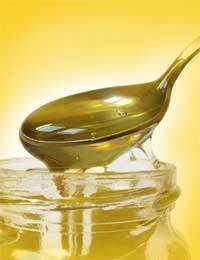 Those following a diet, which considers glycemic ratings, might be keen to replace white sugar with honey. Single blossom honey has a lower rating and will therefore be a more suitable sweetener. Honey is also considered to have other attributes. It is a great source of natural carbohydrates and has long been considered good for coughs and colds and soothing for sore throats. More recently, however, it has also been discovered to be full of antioxidants that boost the immune system and help fight off disease. When used in sugar free recipes, honey also brings a distinctive flavour to the food, a unique sweetness that can enhance the taste. These honey slices are a perfect example. This is a simple recipe to make and will keep well in an airtight container. Wrap slices individually for pack lunches. Preheat your oven to 180 deg C/350 deg F/gas mark four. Melt your butter and honey in a small saucepan over a low heat. Sieve your flour and baking powder into a bowl. Pour the hot liquid in and stir well. In a small bowl beat your eggs. Then stir into your honey slice mixture. Pour into a 25cm tin, which has been greased or lined with greaseproof paper. Bake for about 20 minutes. The mixture will be golden brown and firm to the touch when ready. Remove, leave to cool then slice. Artificial or natural sweeteners that have been created to look and act like sugar can work well in sugar free recipes, but it is essential to read the manufacturers instructions on how to use them. These have various benefits, depending on the individual product, but there is no doubt than many of them are much better for teeth than white sugar. This rice pudding recipe includes a sugar replacement used in moderation. A tasty pudding, this is almost a meal in itself. It is perfect for a winter's evening - or even breakfast! Preheat your oven to 150 deg C/140 deg C/gas mark two. Mix rice, milk and sugar replacement together in a large oven-proof dish. Then sprinkle on your cinnamon or nutmeg. Bake in the oven for an hour and a half until golden brown and your rice mixture is soft and puffy. Remove from heat. Enjoy when warm. Diabetics have to be careful when using other ingredients to replace sugar, but small amounts of sugar free jam can be used with care in recipes. Jam brings to the dish all the health benefits of the fruits used. This delicious recipe shows how well cocoa powder and sugar free jam may be used to give diabetics a rich and sweet treat to enjoy in moderation. A tasty tea-time treat or a delicious pudding, this sugar free dish is fairly rich. It can be eaten hot or cold. Preheat your oven to 180 deg C/350 deg F/gas mark four. Melt your jam, cocoa powder and butter in a medium pan over a low heat. Once melted, stir in your almonds. Beat eggs in a separate bowl then carefully fold in. Pour into a greased 25cm cake tin. Bake for about 20 minutes until firm on top (may still be moist inside). Remove from the heat, allow to cool, and serve with a little whipped cream or crème fraiche.